The Chittenden County Regional Planning Commission (CCRPC) is one of 12 regional planning commissions in Vermont. 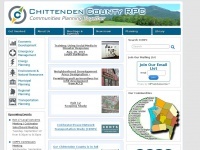 Based on the 2000 census, Chittenden County is home to approximately one-fourth of Vermont's residents, making it the most populous county in the state.The Chittenden County Regional Planning Commission was founded in 1966 to promote the mutual cooperation of its19 member municipalities and to facilitate the appropriate development and preservation of the physical and human resources in Chitten ..
7 links pointing to Ccrpcvt.org were found. Individual words like Ccrpc, Program, Logo and Ccrpcvt are frequently used in text links from other websites. The most important links to the website are from Localmotion.org and Ecosproject.com. The homepage of Ccrpcvt.org and the subsite /database/ are most referenced by other websites. The table shows the most important links to Ccrpcvt.org. The table is sorted in descending order by importance. The table shows websites of Ccrpcvt.org, which are often linked by other websites and therefore they are classified as important content. The web server used by Ccrpcvt.org is run by Media Temple and is located in Culver City, USA. On this web server 10 other websites are hosted. The language of those websites is mostly english. A Apache server hosts the websites of Ccrpcvt.org. For managing the data of the webpages the CMS WordPress is used. The website uses the latest markup standard HTML 5. The website does not specify details about the inclusion of its content in search engines. For this reason the content will be included by search engines.